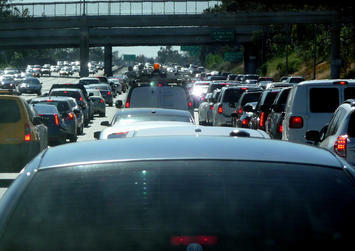 Governor Jerry Brown recently released a plan to find funds to fix California’s roads. Infrastructure funding is one of the essential roles of government, so it’s refreshing to hear that our otherwise dysfunctional state government is taking action on this front. But who will be paying for it? Those who use the roads most, that is, California’s drivers, who disproportionately tend to be members of the middle and working classes. The Brown plan has two main components: a $65 highway user fee, and a lifting of the gas tax by 6 cents per gallon. The rise of the California state gas tax from 66 cents to 72 cents and the imposition of an additional registration fee are the products of a fairly standard view on infrastructure funding. The underlying thought is that the people who use infrastructure should contribute to its maintenance. After all, this is how private enterprises and public utilities from the Washington State Ferries system to the Los Angeles Department of Water and Power stay afloat. Tolls and fees for road use are nothing new, so why should anybody be concerned with small increases in California’s fees, especially when the funds go to so crucial a cause as infrastructure repair? The service-fee model of infrastructure maintenance is theoretically sound. But every policy comes with unintended consequences. In California, the cost of living is driving middle and working-class families to cheaper climes like Texas and Florida in droves every year. The blue regulate-and-tax model does have its uses. It’s important that there are reasonable regulations addressing every area of economic activity, and for certain public goods like vehicle and firearm registration, slight fees are sensible. But regulations have a way of cropping up frequently and never going away, even once they’ve become irrelevant. One regulation turns to four, four to twelve, and taxes and fees proliferate as well. What was once a fair and reasonable system devolves into a tangled web of incomprehensible rules and restrictions, veritably stifling growth, innovation, and freedom. That’s where the regulate-and-tax model of Governor Brown’s infrastructure funding plan is leading us. California drivers already face a plethora of rules and fees, and adding a gas tax and registration fee only complicates the system more. Whatever the benefits are for the state’s coffers, the results are disastrous for those who will be most affected. And it’s not as if the proposed new fees revolutionize California’s infrastructure in any way. The funding plan won’t reduce congestion or improve the flow of people, goods or ideas around the state. The American Interest reports on some important trends in transportation which the money-grubbing Brown plan largely ignores, including smarter cars and busses and ultimately autonomous vehicles. This funding plan is a short-term fix to repair crumbling infrastructure that was built decades ago. Were it something more visionary and transformative, like a series of test courses for driverless electric vehicles, perhaps the added weight on the middle class could be justified. But, like all blue policies, it is merely an attempt to repair a system that was built in another time, for another world. There’s nothing imaginative in it at all. Most sensible political observers would agree that investment in infrastructure funding is one of the state’s most important responsibilities. It pays for itself in time, and the upfront cost is too high for the private sector to take on. The government is the only actor that can adequately plan for and fund infrastructure on a mass scale, and it should do it well. But to pay for the repair of infrastructure, we shouldn’t soak the very people whom that repair is meant to help — the masses of middle-class and working-class California drivers. While service fees are justifiable at times, there are some things, like convenient transportation and quality education, that the government should strive to provide as a workable starting point for upward mobility. The money has to come from somewhere. In the $168 million 2015 California state budget, only $12 million went to transportation and infrastructure development. And of the funds that went to other areas, especially the $50 million apiece going to K-12 Education and Health and Human Services, not all of the money the state spends is going into teaching children or healing illnesses. Public employee pensions make up an estimated 19% of the state’s budget, and while pensions are important for government workers, they don’t particularly benefit the broader economy or the masses of California's population. They also tend to drive polities into bankruptcy, as the fates of Stockton, Mammoth Lakes, and San Bernardino demonstrate. California’s misaligned spending priorities are as titanic as those of the federal government. Funds ought to be redistributed to investments in infrastructure. More importantly, funding to other areas should be more efficient, with more money going directly to services the government is pledged to provide, so that existing taxation could be better dedicated to crucial public investments without soaking the middle and working classes. Budget reform is the most pressing issue California faces today. That's why the issue of Governor Brown's gas tax proposal is so important this year. Only under a reformed budget system can the state make investments in infrastructure, education, and innovation, and run them properly, to promote broad-based economic growth and social mobility. Slapping taxes on the lower classes is a cheap, easy way out of making the uncomfortable steps necessary to realign the state budget. Luke Phillips is a student studying International Relations at the University of Southern California. He has written for the magazine The American Interest and is a research associate at the Center for Opportunity Urbanism. Submitted by qet on Tue, 09/15/2015 - 10:36. Phillips writes: "It’s important that there are reasonable regulations addressing every area of economic activity." Why, exactly? Does the writer not understand that each and every one of those "incomprehensible rules and restrictions" he laments are defended by someone somewhere as "reasonable"? Also, I see nothing in this article about the costs of infrastructure, costs driven by requirements to use only unionized labor, with all of the Blue model expense that goes along with that. Also, Phillips contradicts himself. If, as he says, infrastructure is an important responsibility of the state, and that it benefits the entire economy broadly, and if private enterprise can't front the construction costs, then it cannot be correct to say that its costs should be borne by its users in the manner of private enterprise. It seems like a classic public good whose costs ought to be paid out of general revenue. Which Phillips seems to argue for, so I can't understand the remark about user fees. The fact is that every dollar of current revenue is locked in the vise-grip of some state representative or state senator somewhere under the eulogistic name of some program with his or her name on the enabling legislation that the local paper deems to be necessary. The votes in the politician's district added by diverting some of this district slush money to infrastructure will not even come close to the votes lost by the people who will no longer receive their transfer payments.